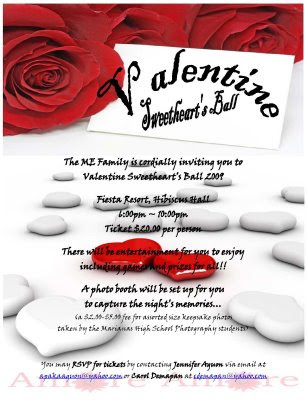 CNMI Marriage Encounter: Valentine's Sweethearts Ball on Feb 14th! Jenni & Mark Aguon are organizing this year's Valentine's Sweethearts Ball on February 14, 2009 at the Fiesta Resort's Hibiscus Hall from 6-10 pm. Tickets are $40 per couple and available for sale through Jenni at apakaaguon@yahoo.com and Carol Demapan at cdemapan@yahoo.com. We look forward to a fun evening of reuniting with the ME Community as well as inviting new prospective couples to this special event.